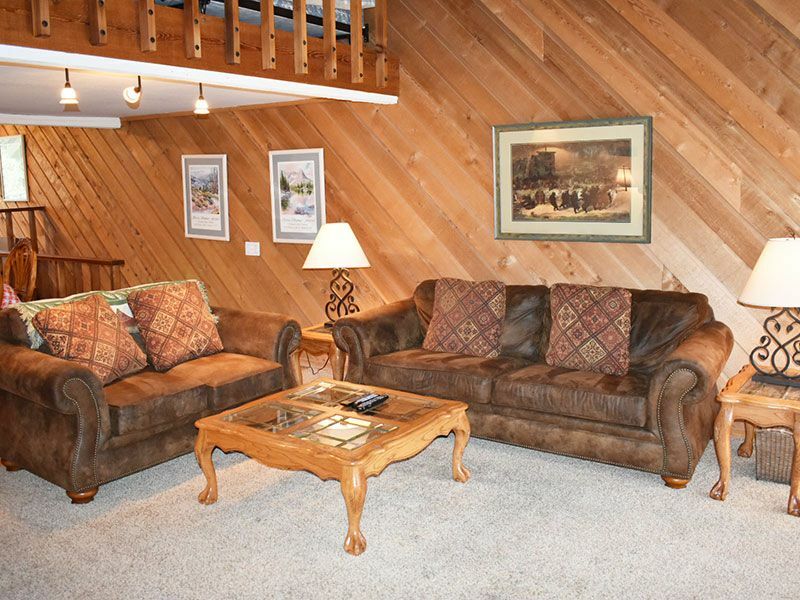 This is a beautiful vacation rental with amazing mountain and meadow views! This 2-bedroom and a loft unit with 2 bathrooms and a 4 star rating has a full kitchen, microwave, fireview woodburner, 4 TVs (flat screens in the living room and both bedrooms), DVD player, stereo with a cd player, washer/dryer, BBQ and a phone. It also has a view of Mammoth Creek (you can hear it from the balcony), the Sherwin Mountains, Mammoth Crest and the meadow from both the living room balcony and the deck in the master bedroom. The master bedroom has a king size bed, the 2nd bedroom has a queen size bed and the loft has a double futon and 2 single beds. There are a few stairs to reach this unit and it has 3 levels inside. The entry level has both bedrooms and both bathrooms. Upstairs is the living room, kitchen, dining area and balcony. The loft is on the 3rd level. This unit sleeps 6 to 8 people. Unit managed under Mammoth Lakes Business Tax Certificate 864. Great location, comfortable condo, needs a deep cleaning. This property has a wonderful location right on the meadow, which is important to our family when we look for a Snowcreek condo. The living room and dining room are very comfortable and the kitchen is nicely stocked with small appliances, dishes, pans and utensils. We enjoyed our 10 night stay. Now for the downside: It was dirty. The kitchen counters & bar were smeared with something... sticky. I had to completely wash down the area before I could even unload our food supplies. The dishes in the dishwasher were still very dirty... didn't the last person or cleaning crew even look? Many of the dishes and utensils also were found to be dirty in the drawers and cupboards. We put anything we wanted to use into the dishwasher before using. The dishwasher works just fine... if you turn it on! The dining room table was covered by a very dirty tablecloth which still had food on it (we washed it). Underneath the tablecloth, were pads protecting the wooden table... the pads were filthy and we had to scrub off the sticky smeared food. We decided to use place-mats on top of the wooden table. (We had to wash the place-mats before using). Went into the bathrooms to find (brown) throw rugs in front of the toilets and in the sink area... they looked like they hadn't been washed in 4 years. I couldn't imagine getting up with bare feet and walking on them... threw them into the washing machine for a double wash... they came out fresh and clean and were a medium green in color! The beds had older mattresses that had a thin memory foam topper. The king was mostly comfortable, the queen guest bed could be replaced. The comforters and blankets need to be cleaned or replaced. They obviously haven't been cleaned in years either and had an odor that is not pleasant to have near your face while sleeping. The closets in the master bdrm were stuffed with very old extra pillows and a huge feather bed, which made it very difficult to try and hang up or use the space for our belongings. It was nice to have the washer and dryer in the condo, but the shelf and cupboard, where you would want to store your own laundry cleaning items were piled and stuffed with junk... unusable space. This condo could be so much better organized if you were thinking of your guests. We did settle in, but will not likely rent it again unless the owners take some time to clean it up a bit. It could be fabulous if they did.